17062 Haynie Lane Jupiter, Fl 33478 has been sold. UNIQUE PROPERTY - ONE OF A KIND 5AC BOTANICAL PARADISE! HUNDREDS OF RARE PALMS, CYCADS, EXOTIC PLANTS & FRUIT TREES. MANY VARIETIES OF MANGOES, BANANAS, JACKFRUIT, CARAMBOLA, LYCHEE, SAPODILLA, AVOCADO ETC ETC. PROFESSIONAL IRRIGATION SYSTEM. HIGH AND DRY ON PAVED ROAD. 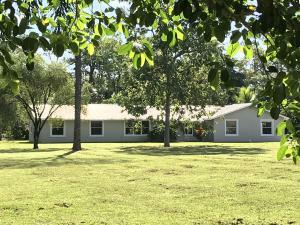 HOUSE HAS METAL ROOF AND HAS BEEN COMPLETELY REMODELED WITH NEW KITCHEN, NEW STAINLESS STEEL APPLIANCES, NEW AC, NEW PAINT AND NEW TILE FLOORS. 5 MINUTES TO I-95 AND TURNPIKE AND RIVERBEND PARK. PEACEFUL RURAL HORSE COMMUNITY WITH A RATED SCHOOL AND ONLY A FEW MINUTES TO SHOPS AND RESTAURANTS. ADJACENT 5 ACRE PROPERTY WITH A REMODELED SF HOUSE ALSO AVAILABLE FOR SALE. 17062 Haynie Lane located in Jupiter, FL is a single family home with 4 bedrooms, 2 full baths and 0 half baths.The Home at 17062 Haynie Lane was built in 1979 in Jupiter Farms and offers a 2 car garage. This Jupiter Farms Home offers none. 17062 Haynie Lane Jupiter, Fl is currently listed for $749,000 under the MLS# RX-10457059. This Home has been put on the Jupiter MLS system and currently has a status of SLD. Information in regards to Jupiter real estate and Jupiter Farms Homes for sale or any other areas may have come from a cooperative data exchange service. All rights reserved. Information deemed to be reliable but not guaranteed. The data relating to real estate for sale on this website comes in part from the IDX Program of the Florida Regional MLS. Listing broker has attempted to offer accurate data, but buyers are advised to confirm all items. We provide all information about Jupiter Homes for sale and Jupiter Farms real estate and all other site listings as is with absolutely no warranties. This site will be monitored for 'scraping' and any use of search facilities of data on the site other than by a consumer looking to purchase real estate, is prohibited. Feel free to contact our agents to find a great Jupiter Farms Jupiter specialist.